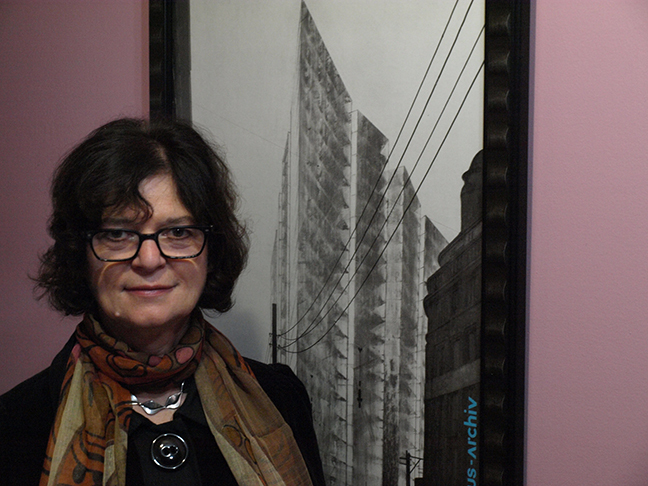 Carla Harryman is the author of seventeen books including the prose diptych W—/M— (Split Level, 2013), a collection of experimental and conceptual essays Adorno’s Noise (Essay Press, 2008), Baby (AIP, 2005), Gardener of Stars: A Novel (Atelos, 2001), The Wide Road (Belladonna, 2011, with Lyn Hejinian) and a sequence of essays in The Grand Piano, a multi-authored experiment in autobiography in ten volumes about art and culture in the San Francisco Bay Area between 1975-1980, (Mode D, 2011). Her Poets Theater, interdisciplinary, and bi-lingual performances have been presented nationally and internationally. Recent work in performance includes the “re-performance” of Theodore Adorno’s 1959 lecture “Music and New Music” at dOCUMENTA 13 in Kassel, Germany (with Magda Mayas and music composition by Jon Raskin) and the publication of Open Box, a music and poetry collaboration with Jon Raskin (Tzadik, 2012). She is co-editor of Lust for Life: On the Writings of Kathy Acker (2006) and the editor of Non/Narrative a special issue of the Journal of Narrative Theory (2011). She serves as Associate Professor and Coordinator of Creative Writing at Eastern Michigan University. She also teaches on the MFA faculty of the Milton Avery School of the Arts at Bard College and is currently a Senior Artist in Residence at the University of Washington, Bothell. A commitment to experimental pedagogy recently took her to the Oakland Public School in the San Francisco Bay Area where she led a seminar on Ernst Bloch’s The Principle of Hope. Carla Harryman is a contributor to Nerve Lantern issue 2. 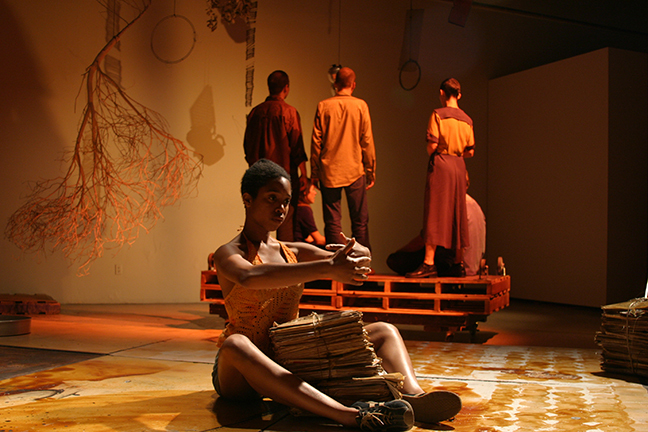 Walonda Lewis and the Poet Chorus in Carla Harryman’s play Performing Objects Stationed in the SubWorld.